Lemon Ricotta Cake with Dreamy Vanilla Pastry Cream is a match made in heaven. 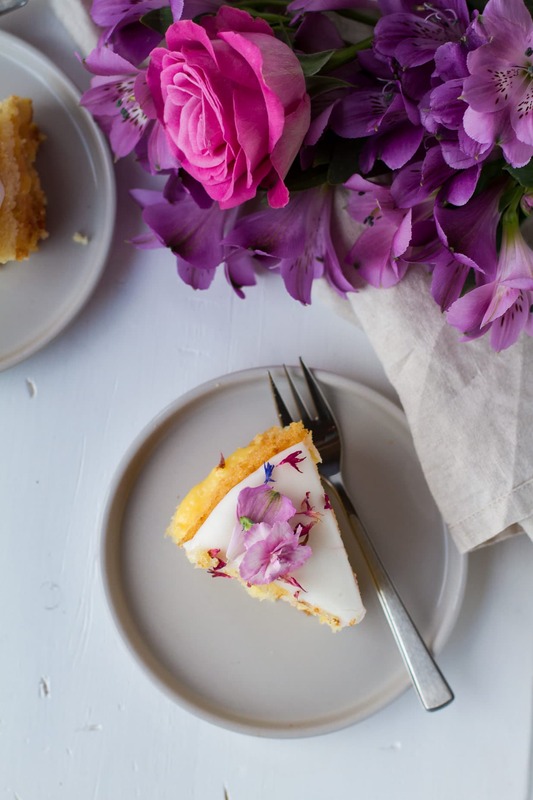 Citrus infused, moist and delicious ricotta cake and the creamiest vanilla pastry – you just can’t go wrong! 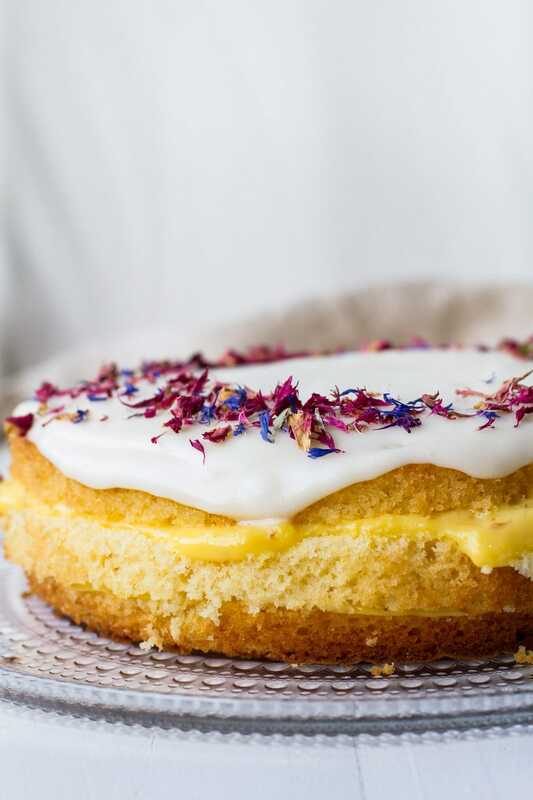 This cake is simple and lets the lemon and vanilla really shine. So January 31st is my birthday, and I wanted this week’s recipe to reflect that. And because the greatest cake in the world actually is a family secret (so sorry! ), this is the closest I could get without telling the other recipe. And let me tell you – it is amazing! I’ve used this sponge cake in countless cakes, with just minor tweaks, because it works like a charm. It’s also easy to just double and make a gigantic cake. I promise you, it looks like a lot, but it’s gone in a flash! Preheat your oven to 150C (300F). Grease a round 9 inch (23 cm) cake pan. In a medium bowl, whisk together ricotta, lemon juice and zest, vegetable oil and vanilla extract until a creamy consistency. You can whisk this by hand. In another bowl, whisk together (hand or stand mixer) eggs and sugar, on medium high speed for about 7 minutes. Add the ricotta mixture into the eggs and whip until just incorporated. Sift flour and baking powder into the batter. Be careful here as to not ruin the bubbles of the egg/sugar mixture. Using a rubber spatula, fold it in and take it in small portions, maybe around 40 grams, then fold, then 40 new grams. This is a boring and tedious task, but it really does wonder for the end result, which makes it massively worth it. The cake was so fluffy! Bake the cake for around 90 minutes or until a toothpick comes out clean. If the cake starts to brown too quickly, either reduce temperature or add aluminum foil on top. A little browning is fine and even wanted! Cool the cake completely before you remove it from the pan. Peel off the parchment paper. If your cake is slightly uneven, just cut it to even it out. If not, leave it as is and using a serrated knife, slice the cake horizontally into 3 layers. Pour this mixture back into the saucepan, make sure you bring with you the vanilla seeds. Heat the mixture back up, until it is thickening. Remember to stir. Place the saucepan into a tub of cold water to cool, remove the vanilla beans. Cool to lukewarm, but not completely cold. 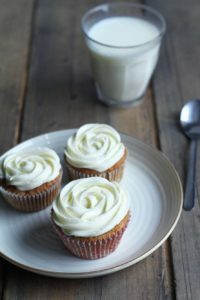 If you’re Norwegian, or happen to have powder form vanilla sauce, I also have an even easier way of making this vanilla pastry cream. 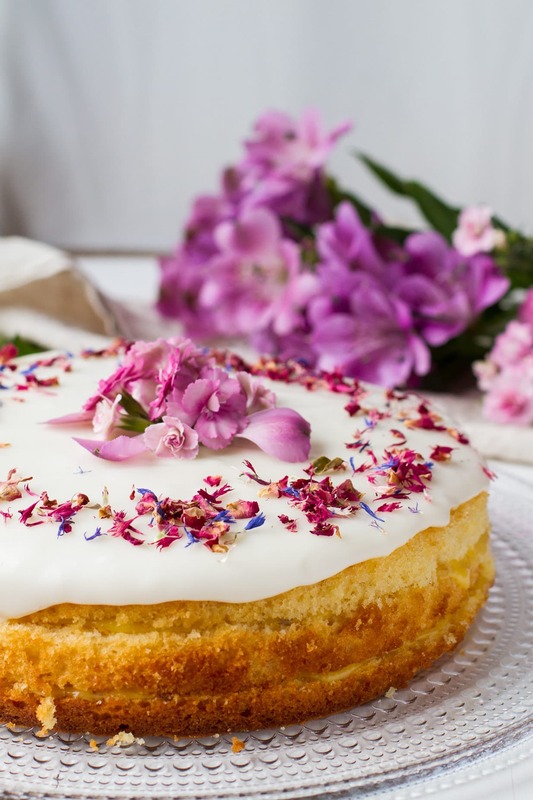 If you follow the vanilla cream option 1 in this Vanilla Custard and Coconut Sweet Buns, it is basically the same as in this cake! The difference is that in this cake it won’t be baked afterwards. And by the way, I super highly definitely recommend trying those sweet buns, because I think those may be my favorite thing in the whole world. Take the bottom layer of the cake and pour half of the vanilla cream on top, even it out. Add the next cake layer on top and pour the rest of the vanilla cream on top. Take the last cake layer on top of this. Now it’s ready for some frosting! Mix powdered sugar, lemon juice, cream cheese and vanilla bean sugar (or vanilla extract), using a handheld mixer or even by hand. Add it to the top of the cake, leaving the sides naked. You may think the frosting is a little too acidic, but that’s the point. 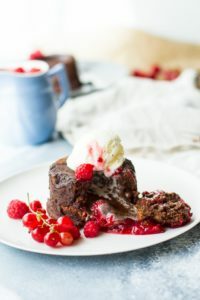 It’s going to balance the sweetness of the cake, making a dreamy combination! Decorate if you wish, but it’s likely gone before you get to think of any! This lemon ricotta cake tastes amazing with a glass of milk or a cup of tea. It keeps very well for 4-5 days in the refrigerator, maybe even longer. Could also just store in a cold place if you don’t have room in the fridge! Freezes well too. In a medium bowl, whisk together ricotta, lemon juice and zest, vegetable oil and vanilla extract until a creamy consistency. You can whisk this by hand. Sift flour and baking powder into the batter. Be careful here as to not ruin the bubbles of the egg/sugar mixture. Using a rubber spatula, fold it in and take it in small portions, maybe around 40 grams, then fold, then 40 new grams. Bake the cake for around 90 minutes or until a toothpick comes out clean. If the cake starts to brown too quickly, either reduce temperature or add aluminum foil on top. A little browning is fine and even wanted! Cool the cake completely before you remove it from the pan. Peel off the parchment paper. If your cake is slightly uneven, just cut it to even it out. If not, leave it as is and using a serrated knife, slice the cake horizontally into 3 layers. Pour this mixture back into the saucepan, make sure you bring with you the vanilla seeds. Heat the mixture back up, until it is thickening. Remember to stir. Place the saucepan into a tub of cold water to cool, remove the vanilla beans. Cool to lukewarm, not completely cold. Take the bottom layer of the cake and pour half of the vanilla cream on top, even it out. Add the next cake layer on top and pour the rest of the vanilla cream on top. Take the last cake layer on top of this. Now it's ready for some frosting! Mix powdered sugar, lemon juice, cream cheese and vanilla bean sugar (or vanilla extract), using a handheld mixer or even by hand. Add it to the top of the cake, leaving the sides naked. Decorate if you wish. It keeps very well for 4-5 days in the refrigerator, maybe even longer. Could also just store in a cold place if you don't have room in the fridge! Freezes well too. Did you make it? Tag @thegingerwithspice / #gingerwithsipce on Instagram, I'd love to see! Simply beautiful! This lemon ricotta cake will make the perfect mother’s day dessert too. Happy Birthday! Thank you so much! Yes, it is perfect for Mother’s Day too. This is one beautiful cake. Love the fact it is not covered in icing from top to bottom. Simple is best in taste and decorating…and you have nailed it here. Thanks, Gloria! A cake must be good, first and foremost, and then looks comes after, in my opinion! Too much frosting just isn’t good on most cakes. Happy birthday! I hope your day is fabulous and full of celebration. This cake sure does look like a great way to enjoy the occasion. I’ll have to give it a try! Thank you so much, Amanda. I hope you get to make it! OH my goodness! 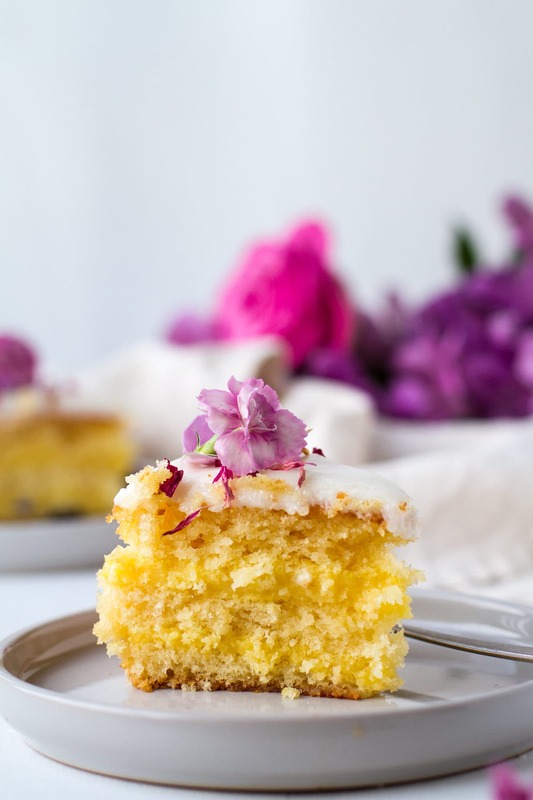 This lemon ricotta cake looks delicious!!! I LOVE lemon flavored sweets and treats!! So fresh and flavorful! really all you had to say was lemon ricotta and i was sold. But add the vanilla cream and I’m now drooling on my key board!! Lemon ricotta is the bomb! I might have to get you a new keyboard though! 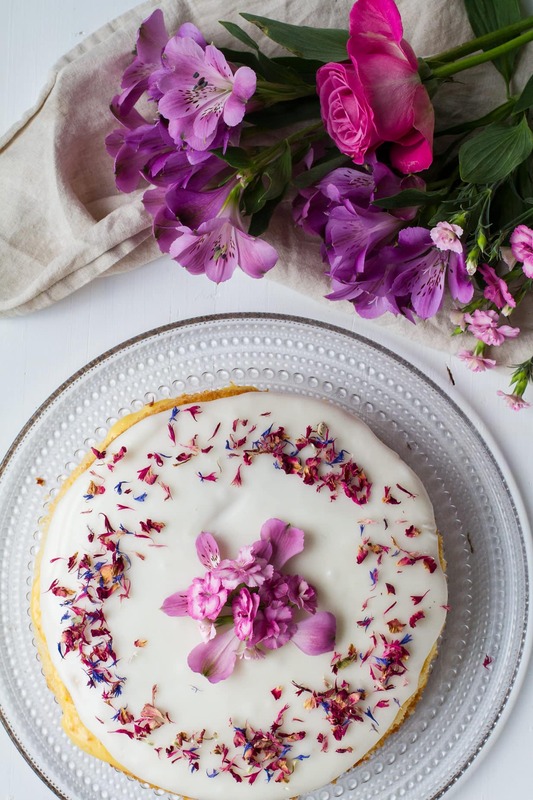 This cake looks so dreamy and beautiful! Love how you add ricotta to this cake to make it so moist. And I also want this on my birthday, too. Happy birthday! A belated happy birthday from Italy! This is such a pretty cake. I love the combination of ricotta and lemon, in both sweet and savoury dishes! Thank you so much, Jacqueline! Ricotta and lemon is amazing – both sweet and savory! This cake is beautiful! 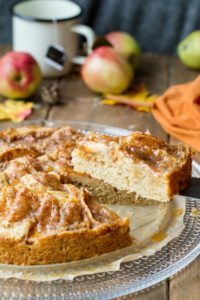 I love the texture and the pastry cream- so creamy! I am also loving the flowers with the cake- beautiful! My mouth is watering, it’s my afternoon coffee time. I would love a piece of the lemon ricotta cake! Oh yes, so do I right now! Thank you! 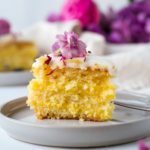 I agree – there is barely anything better than vanilla pastry cream and lemon ricotta cake – they match each other perfectly! 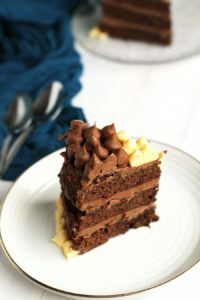 I am super excited about your recipe because that vanilla pastry looks so creamy – literally the best pastry you can get for this cake! Thank you so much, dear Mimi! Wow, this cake is stunning …but most importantly, HAPPY BELATED BIRTHDAY! 🙂 You really treated yourself with this masterpiece. 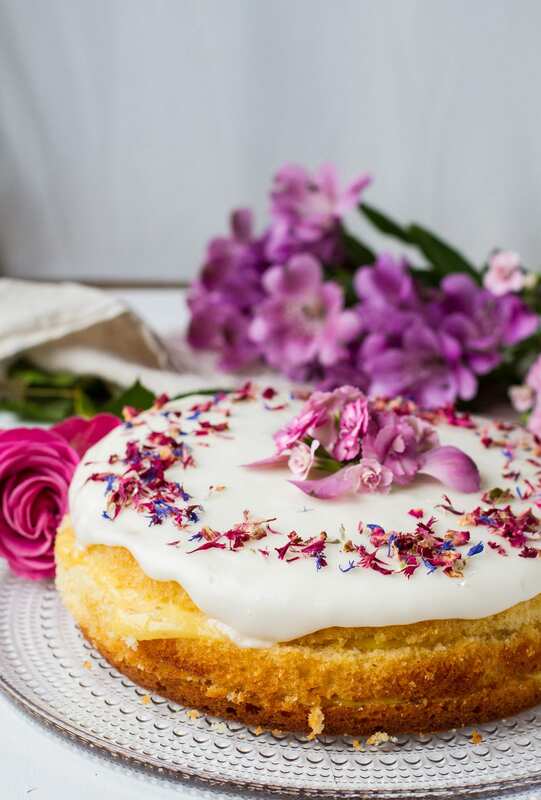 This looks so delicious – and your photos are gorgeous! I can just imagine biting into this cake! It looks so springy, too! Thank you so much, Stephanie! Folding the flour into the batter makes it very airy! Hi there… just about to embark on making this cake, one question 90 minutes baking time? Hey Christopher. That is right. You can check it after 80 minutes with a toothpick, but it should be around 90 minutes. This is because it is a fairly large cake on low temperature. It will be a moist, fluffy cake with a little brown exterior, as you may see on some of the pictures.